The discovery of the Roman inscription has come at the start of the 56th annual summer digs at Novae conducted by archaeologists from Bulgaria and Poland, which started last week. The newly found inscription in Latin is the first instance of an inscription found in the Roman city of Novae in which the names of Apollo and Diana appear together, says Assoc. Prof. Pavlina Vladkova from the Regional Museum of History in Bulgaria’s Veliko Tarnovo, who is one of the lead archaeologists of the excavations in Novae, as cited by the Trud daily. “The newly found Roman inscription on the pedestal is only partially preserved, and there is no information about the dedicator, and their ethnicity and social status. The deep engraving of the Latin letters and their precise writing indicated that the monument dates to the 2nd century AD. The fragment also appears to have been used a second time for construction – in the wall of a building from the 4th century AD, which is located outside of the Roman military camp, near Novae’s western fortress gate,” explains Vladkova. The newly found Roman inscription has been discovered almost at the same place where several years the Bulgarian archaeologists unearthed another pedestal with a dedication to Roman deity Minerva, as Novae is known to have worshiped the Roman deities from the Capitoline Triad – Jupiter, Juno, and Minerva. Now the archaeologists believe that both fragments with inscriptions were brought from a nearby Roman pagan shrine or temple demolished in the 4th century AD, possibly after the adoption of Christianity, whose fragments were used as construction material for a sizable public building, which has been excavated by Assoc. Prof. Vladkova in the recent years. Given that the newly found Latin inscription is seen as unique because it mentions Apollo and Diana together, the archaeologist reminds that there are only three Roman inscriptions found in Novae which are dedicated solely to god Apollo. Those have been found on an altar, a pedestal, and a votive table with a depiction of the Thracian Horseman (Heros), the supreme deity of the Ancient Thracians, which, however, was dedicated to Apollo. The epigraphic monuments from Novae dedicated solely to the goddess Diana are also three. Two of those have been found on altars, and one of them – on a pillar. One of the altar inscriptions was commissioned by Marcus Ulpius Peregrinus, a tribune of the First Italian Legion (Legio I Italica), and the other altar inscription – by a woman named Acutia Liberalis. The pillar inscription is the most impressive of the three: it is dedicated to Diana Sancta (the holy, saintly Diana) by Valerius Victor; it was found built into a wall of the valetudinarium, i.e. the military hospital of Novae, but had originally been part of a temple of Diana built in the early years of the Roman military camp on the Danube. The newly discovered Latin inscription at the Roman city of Novae near Bulgaria’s Danube of Svishtov is also interesting because in it the name of Apollo is written before that of Diana, while usually in the Roman inscriptions found in the Roman province of Moesia Inferior (which encompassed most of today’s Northern and Northeast Bulgaria and Southeast Romania) the names of Apollo and Diana appear the other way around. In this region, only one other Roman inscription dedicated to the two gods has been found which mentions Apollo first from Moesia Inferior. “In today’s Bulgaria, the most famous [Roman] shrine dedicated to Diana and Apollo is located in [the Roman military camp and city of Montanesium, in] today’s Bulgarian city of Montana. It features numerous inscriptions commissioned by the legate of the First Italian Legion (Legio I Italica), by officers and veterans, etc, who resided there temporarily as part of a cohort from the same legion which was sent [to Montanesium] from Novae,” explains Vladkova. 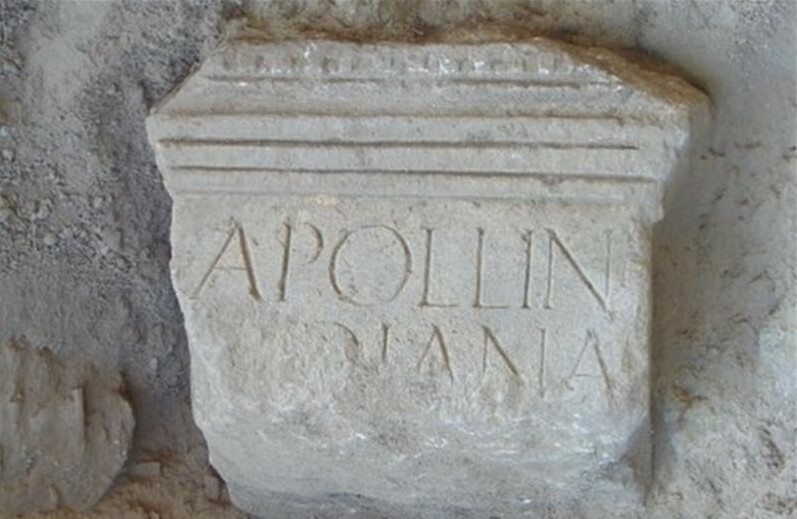 The newly found inscription with the names of Ancient Roman, Thracian, and Greek deities Apollo and Diana is intriguing for one more reason – the dedication form of the name of god Apollo written as “Apollini”. In modern-day Bulgaria, the form Apollini has only been found in inscriptions in the Roman shrine in the northwestern city of Montana commissioned by senior administrative officers from the First Italian Legion based in Novae. This has led the archaeologists to conclude that this form of Apollo’s name was specifically used by Roman servicemen serving in Legio I Italica. Vladkova notes that the cult for the ancient goddess Diana in the Roman military camp Novae can hardly be associated with her traditional role as a goddess of fertility and patron of women and nativity. Rather, as of 187 BC, Diana had been celebrated by the Romans as a military deity . According to Roman historian Seutonius (ca. 69-122 AD), during the reign of Rome’s first Emperor Octavian Augustus (r. 27 BC – 14 AD), the temples of Hercules (Heracles), Jupiter, Mars, and Diana were renovated. The official celebration of Apollo assumed by the Emperor as his patron began at about the same time. “The discovery of the newly found inscription in Novae complements the information about the celebration and worshiping of the two deities which are associated with the official state cult for the emperor, and it can be said that Apollo and Diana were no less important than the supreme Roman god Jupiter Optimus Maximus,” conclude the Bulgarian archaeologists.